Promoting Collaborative Learning in the Early Childhood Classroom: Reggio Emilia, Italy, and Amherst, Massachusetts. Edwards, C.P., Gandini, L., & Nimmo, J. (1994). Promoting collaborative learning in the early childhood classroom. In L.G. Katz & B. Cesarone, Reflections on the Reggio Emilia Approach. Perspectives from ERIC/EECE: A Monograph Series, No. 6 (pp. 81-104).Urbana,Illinois: ERIC Clearinghouse. Also published in Italian as: Edwards, C.P., Gandini, L., & Nimmo, J. (1992). Favorire l'apprendimento cooperativo nella prima infanzia: Concettualizzazioni contrastanti da parte degli insegnanti en due comunita. Rassegna di Psicologia, 9(3), 65-90. 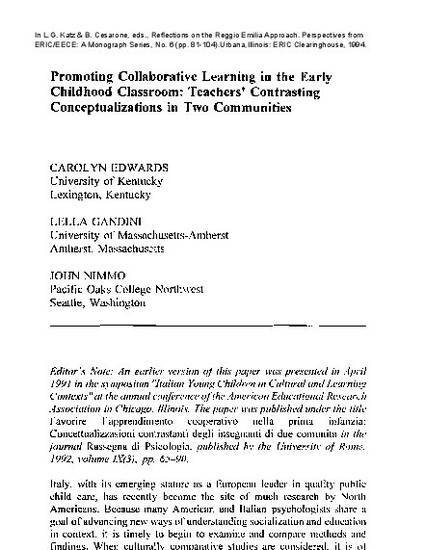 This chapter describes a study that was conducted in Reggio Emilia (Emilia Romagna, northern Italy), Pistoia (Tuscany, Italy) and Amherst (Massachusetts, USA) as part of a three study project investigating how teachers promote collaboration and community in their classrooms. The methodology involved a combination of teacher interviews with an adaptation of the “multivocal video-ethnography developed by Tobin, Wu, and Davidson (1989) for Preschool in Three Cultures. This paper describes the findings from the Collaboration Interviews with teachers in Reggio Emilia and Amherst, showing intersections and differences in their concepts of young children’s capacities for cooperation and teachers’ roles in promoting it.